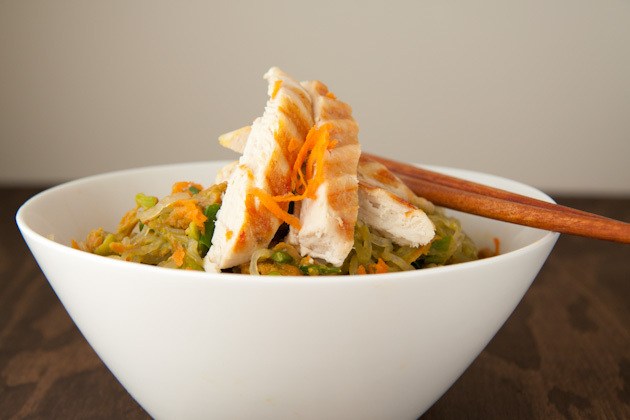 Packed with all of the ingredients you’d find in a California roll, in a convenient bowl of low calorie noodles! Place approximately 2-3 cups of hot water in a large bowl. Place noodles in the hot water for 1-2 minutes until soft. Drain and place in a serving bowl. Set aside. In a small bowl, combine soup, broth, onion, miso, braggs, and dried chiles. Pour mixture over top of noodles and stir to coat. 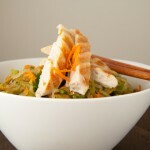 Top with chicken, grated carrots and enjoy!